howdy everypony remember back when ah told y'all ah was workin on somthin big well here it is took me bout 6 weeks of free time to make so hope y'all like it its 5000 by 2813 so hope thats big enough for y'all hopin this here picture gets submitted to that there site *equestria daily* anywho hope y'all enjoy see ya round guess what y'all ah got my wallpaper in one of equestria dailys wallpaper posts yeehaww!!! I used this piece in the VN/CYOA adaptation of ‘Brony Hero of Equestria’! Huge thanks for making such amazing art! Want to play? Download it at ailurusfulgen5.deviantart.com/… ! Plus, you're in the credits! Hi! may I use the background for a fan-game project? Eeeyup! [link] Are You agree with this use? Looks great. Would you be able to post the source file? Thanks. Very well-organized. Have you considered using Illustrator for vectoring? I know what you mean. The shortcuts are a bit different which takes some getting used to, but there are some features that make it better suited for vector creation. Planning on working with a lot of vectors down the road, it might be worth giving it another shot. Just a suggestion. 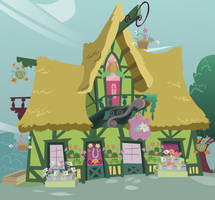 Using these town view wallpapers i can probably make some kind of map of what Ponyville looks like. I'll give you credit of course. can i use it to do another image?? Ah, isn't it every young pony's dream to live inside a giant cupcake? Woooo-o-oh! not really sized like a wallpaper. but it's resizable after all, right? anyway, that's really well made. i admire the quality, details and colors in HD and in HR. toally delicious. i'm gonna use it. btw, how many times it took you to vectorize it? PD: will you do the houses of the other 5 ponies?